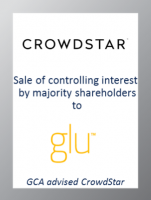 We are pleased to announce that our client, CrowdStar, has sold a controlling interest in the Company to Glu Mobile (NASDAQ:GLUU) in an all-cash transaction. Both Glu and CrowdStar develop free-to-play games for smartphones and tablets, and the combination of the two companies allows Glu to diversify its content portfolio and become the leader in the growing fashion game category. GCA acted as exclusive financial advisor to CrowdStar in connection with this transaction.